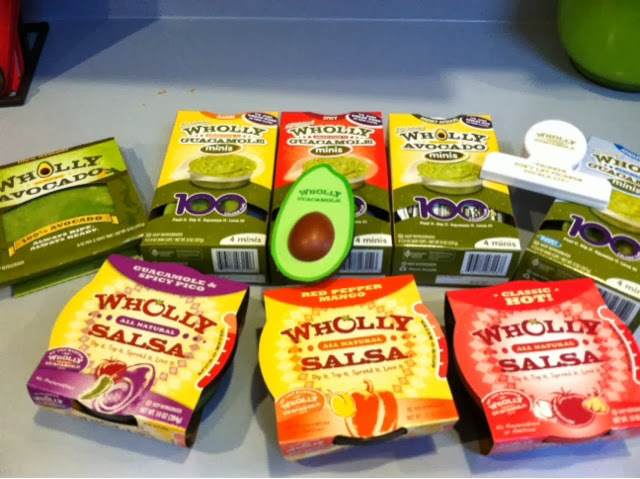 We received a fantastic package FILLED with delicious Wholly Guacamole products!!! The Wholly Guacamole minis are small and portable versions of Wholly Guacamole. I love them because only myself and my husband eat guacamole, so these are the PERFECT size. And these tiny packets are just 100 calories. We also loved the Wholly Salsa! Perfect for football parties on the weekend! Just throw in a bowl, add some chips, and you have a fast appetizer! Did you know the Wholly Guacamole website features all sorts of fun recipes. We love this chicken salad in a pepper! So easy and so fun! Mix oil, 1/4 tsp salt, black pepper, cumin, sugar, chili powder, lime zest and jice of 1 1/2 limes. Add to chicken and allow to marinate for at least 20 minutes- do not exceed 30 minutes. Grill chicken on each side for 2 minutes. to finish cooking, place in 400 degree oven for 8 minutes and allow chicken to rest for 5 minutes before dicing. Mix in bell peppers, onion, cilantro, WHOLLY GUACAMOLE dip, diced chicken, the rest of the lime juiced and the remaining salt. Notes-- Serve in a pita wrap, on a whole wheat bun, as a lettuce wrap or with crackers. MamaBreak received product(s) to review here on the website. We did not receive any other type of compensation. As always, our opinions and experiences are our own.